Methi wali mung ki daal would not make you drool when you hear it. But cook it with fenugreek micro greens or sprouts and see how the mung ki daal transforms with a hint of garlic and ghee. Mung ki daal gets repeated the most in my kitchen. Not only because it is a healthy lentil, I love the taste and cook the mung ki daal in many different ways and the daal behaves differently with different treatments given to it. Like if pressure cooked, the daal is a buttery texture, if pan cooked the daal remains a little coarse but with so much more taste and a mild aroma in it. Mung ki sookhi daal is another favourite of mine. I add baby spinach to mung daal more frequently and sometimes bathua leaves whenever I want to add some greens to the mung daal, but methi greens are rare in my mung daal. Unless it is tender methi (fenugreek) sprouts. The fenugreek sprouts are actually sort of micro greens of methi. I often sprinkle some methi seeds in a plastic packaging tray that comes with meat or chicken from the meat shop. It is easy to grow micro greens of some seeds in such re-purposed trays or containers, just fill them up with a layer of soil after poking holes in the bottom and sprinkle the seeds, water the tray sparsely and wait for 2-3 weeks. 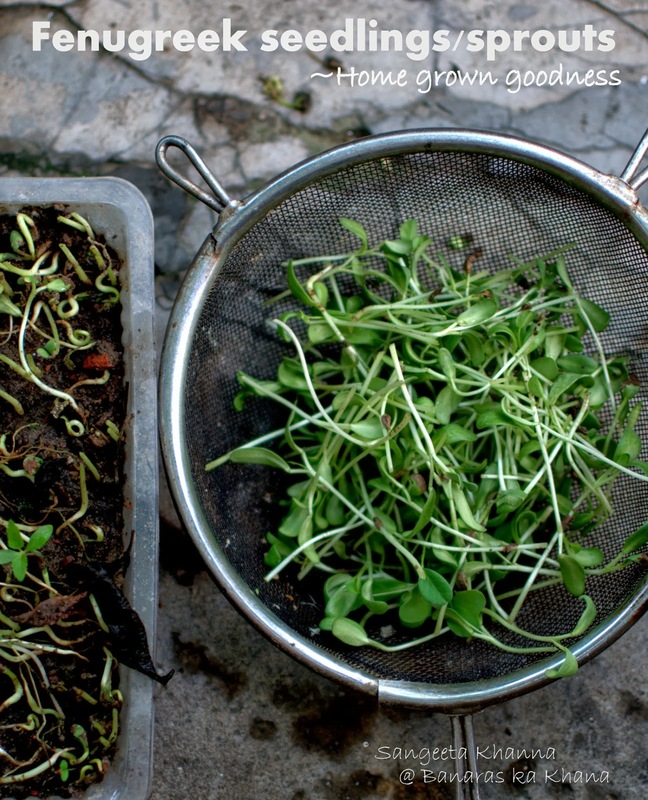 The micro greens or sprouts will make you happy for salads or curries. You can grow such micro greens of mustard, radishes, peas and chickpeas easily. Just snip them, rinse well and enjoy home grown greens. This recipe of mung daal with methi sprouts is easy, but takes about half an hour to cook at a leisurely pace since I prefer doing it in a pan. This daal is always cooked when I have a peaceful alone time in the kithcen and do some more chores along with the daal being cooked with all it's aromas to fill me up. Pressure cooking saves time and you can always do that if you are okay with the textures. 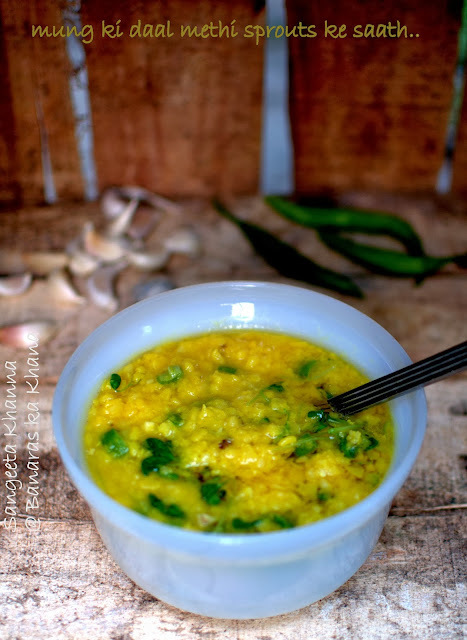 Cook the mung daal along with water, turmeric powder and salt in a deep pan over medium to low flame. Keep stirring in between to avoid spilling the watery liquid. The daal takes about 15-20 minutes to cook to desirable texture. Add small amounts of water if required during the cooking time. Do not cover the pan as the daal is likely to spill over if you cover it. Prepare a tempering with ghee and cumin when the daal is cooked. Heat ghee in a separate pan, add the cumin seeds and wait till they splutter and get aromatic. Add a pinch of hing if you like and then tip in the garlic and wait till the garlic gets pink. Take the pan off the heat, add the green chillies and the methi sprouts, mix well quickly and pour over the cooked daal. Stir lightly and cover for a couple of minutes before serving it. This daal is best eaten just after the tempering. It makes a meal for me sometimes, or a roti and a large serving of a plain vegetable curry is what I like with this. You might like to use a little more ghee to the tempering, please go ahead and add more ghee especially if you are not having any other fats or carbs with this daal. This is truly satvik food, cooked to heal and nourish the body, mind and soul. Mung daal has always been the food for breaking fasts, for cleansing and for light eating. With fenugreek sprouts it becomes so fragrant and flavourful. The garlic is the only non satvik element in the daal if you talk in strict Hindu terms, but who cares when garlic has so much healing properties and is so yummy. 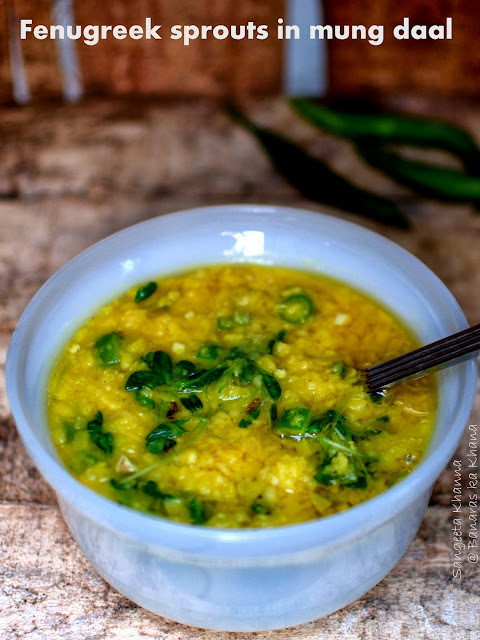 I would recommend using the mild green chillies in this daal and use them liberally as the chilly capsaicin adds immense flavours to this daal. I use the Anahiem type green peppers a lot, they are called Bangalore chillies here and lend a great taste to a few curries I cook. We had a nice mutton mince curry with lots of these peppers and loved it so much. The recipe is coming soon. Stay tuned.